Serengeti National Park is renowned for the Great Migration of over 1.5 million wildebeests that thunder across the vast open plains, but each section of the park offers unique safari game viewing throughout the year. 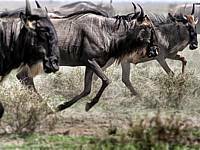 In the eastern Serengeti, the Great Migration traverses the area in October and November after returning from Masai Mara National Reserve in Kenya. 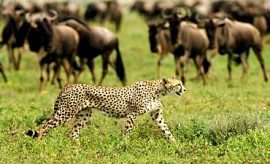 Beyond this immense spectacle, the region is home to a large concentration of cheetahs and many other mammalian species. At an elevation of 6,000 feet, Taasa Lodge — a mid-range accommodation previously known as Buffalo Luxury Camp and Leopard’s Ridge — offers breathtaking views of the Lobo Valley in the eastern corridor of the Serengeti park. 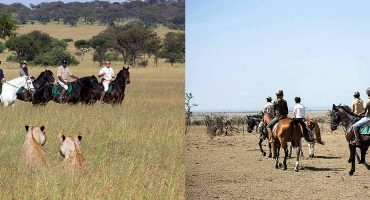 Since the camp is located in a private concession on the outskirts of Tanzania’s most famous national park, guests have quick access to the park for game drives, yet are also able to enjoy unrestricted, off-road experiences outside the park’s fenced boundary during their wildlife-viewing holidays. In the wilds of East Africa, Taasa Lodge offers 12 gorgeous tented accommodations to suit the needs of every AfricanMecca guest, offering elegance and sophistication blended with all the comforts of home. Large suite tents are furnished with cozy areas for reading, relaxing, writing, and enjoying conversations while looking out over the grand landscape of the Serengeti. Plush twin or king-size beds are situated on elevated platforms in the back of the tents. The headboard of the bed acts as privacy divider with the bathroom at the back. Groups of three visiting Serengeti National Park or guests who are traveling on an adventurous family safari vacation with a young child can opt to stay in the triple tent. Each of the tented suites has a chic brick interior bathroom that offers a shower area and twin basins, perfect for freshening up in style after a long day in the bush. Overlooking the camp, the main lodge blends with the landscape and houses the camp's dining area, bar, and library. A beautiful fireplace and common seating area provide guests with ample space to gather and enjoy each other's company by sharing entertaining travel stories of their wildlife encounters and African journeys. Outside, the patio offers community lounge areas to enjoy expansive views of the valley and resident wildlife, as well as a fire pit to fend off the chill of the night air. 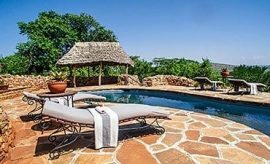 At Taasa Lodge, guests discover the fauna of the Serengeti National Park and the private concession through various tour activities, such as daytime and night game drives and bush walks, both of which lend to memorable trip experiences in Africa. 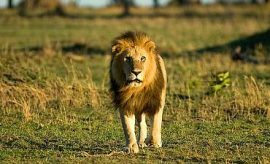 Early morning game drives reveal prides of lions and other carnivores sharing their recent kills while herbivores graze and smaller animals hunt for food. In the afternoon, the fauna travel to the river to drink before the skies darken for the night. 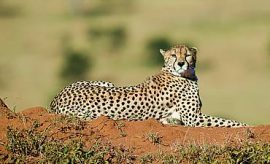 Your game driving experiences will see you travel in the comfort of a 4x4 vehicle with unobstructed views of herbivores like elephants, wildebeest, and giraffes, as well as carnivores like cheetahs, wild dogs, leopards, and many other animals. To give you the optimum viewing opportunities, the experienced guides and Maasai trackers maintain radio communication between guided safari vehicles to share tracking intelligence, such as last sightings, footprints, and approximate location. 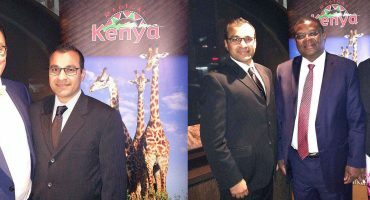 Using this information, your AfricanMecca guide travels to the best locations to see large numbers of various fauna. In addition to daytime game drives, Taasa Lodge offers once-in-a-lifetime opportunities to explore the beauty of the Serengeti during night drives in their private concession. 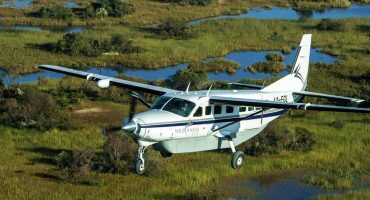 Under cover of darkness, the wildlife experience of the Serengeti transforms. Herbivores prepare to rest while lions, wild dogs, hyenas, and other carnivores begin their evening hunts. Night game drives give you an incredible opportunity to observe the carnivores as they dominate the night and search for prey, and also view nocturnal wildlife such as the honey badger, bat-eared fox, porcupine, bush-baby, pangolin, aardvark, aardwolf, and smaller predators like the African wildcat, common and large spotted genets, African civet, and many more. Bush walks provide an up-close interaction with the ecosystems of the Serengeti. During the safari bush walks, you are guided by a local tracker and protected by an armed guard. Sundowners highlight the spectacular sunsets of the Serengeti. You travel to a perfect vantage point to watch the setting sun while enjoying refreshing beverages and cocktails before dinner. The Maasai people play a significant role in the Serengeti, and Taasa Lodge offers you the chance to visit a local village and immerse yourself in Maasai traditions, culture, and craftsmanship. You are treated to gastronomical delights during your stay at Taasa Lodge. As the sun rises, you awaken to the aroma of freshly brewed coffee or tea and delectable biscuits, before going out on a morning game drive to view the wildlife. During the day, you enjoy light fare while on your game drives and bountiful breakfasts and lunches served at the lodge, featuring platters laden with scrumptious offerings like fresh fruit and local cheeses. The staff of Taasa Lodge awaits your requests for meals that meet your personal desires, including a picnic meal for your game drives and bush walks. Over afternoon tea, you will meet with your guide to plan a late day game drive or an evening drive to watch the sun sink below the magnificent Serengeti hills. At the end of your day, the chef prepares an extravagant meal to your liking and serves it in the camp, which is filled by candlelight dancing on tables covered in fresh linens and set with exquisite china and crystal. For a truly unique dining experience while in East Africa, a boma dinner reflects the traditions of the Maasai tribe. These dinners are reserved for AfricanMecca groups of six or more guests and are served in a traditional karal, surrounded by acacia with a blazing campfire to fill the night air with glowing light. When staying at Taasa Lodge in Eastern Serengeti, we recommend combining it with your Northern Tanzania safari to Tarangire, Lake Manyara and Ngorongoro Crater. 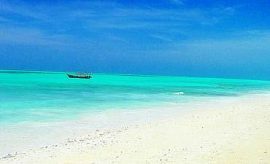 End your trip with a Swahili cultural tour and beach holiday in Zanzibar.